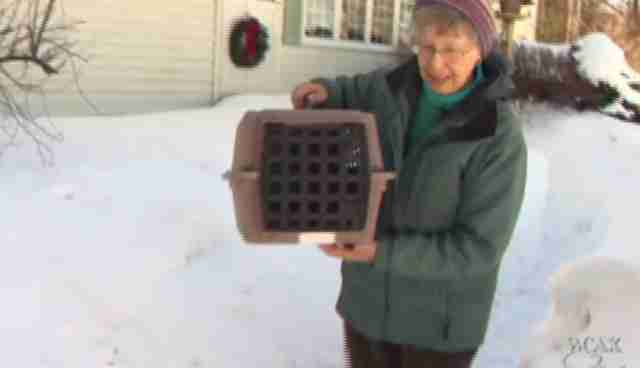 Nancy Hill is a nice person, so when she saw what looked to be a sweet kitty outside her home in Greensboro, Vermont, huddling in the snow on a chilly day this week, she didn't hesitate to try to help. Though had she hesitated even for just a moment, perhaps she would have noticed that the frigid feline wasn't in need of any assistance -- after all, it was actually a bobcat. "It was below zero and I thought the poor cat needs to get in and thaw in warmth," says Hill, sweetly. She then grabbed an old cat carrier and marched dutifully out into the freezing weather, taking note of a bit of blood and patches of fur on the ground -- not realizing that it was likely a fresh kill belonging to the wild predator she was about to attempt to capture. Undeterred, she pressed on. It was only after arriving close to the animal, who had likely been puzzling over this human's audacity to approach it despite the claws and teeth, did Hill discover that it was no needy pet. "Well once it got up, it went so fast," she says. "It was scary." Fortunately, Hill survived the incident unscathed, hurrying back inside to snap a few photos of the cat that turned out not to be a housecat. 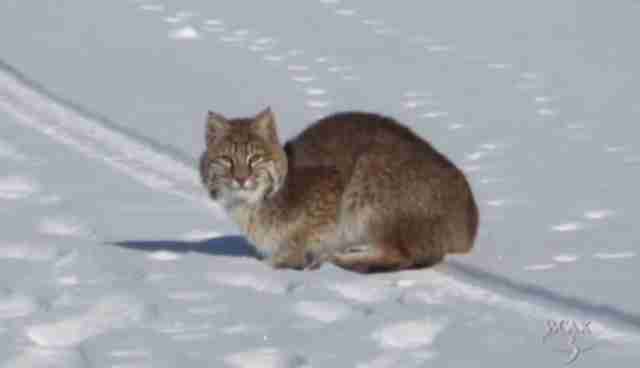 A wildlife expert in Vermont tells local news station WCAX that encounters with bobcats have become quite common, particularly due to the above-average snowfall which makes them travel farther and wider in search of food. 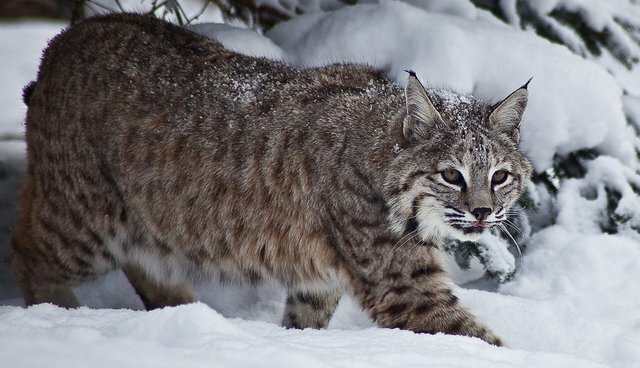 "When there's deep snow for prolonged periods of time our bobcats tend to have a tougher time," says Kim Royer of Vermont Fish and Wildlife. "If you see one, be excited, appreciate the fact that we live in this great state where bobcats still do very well, and leave ‘em alone." Nancy says she will certainly heed that advice going forward, adding that she probably couldn't have gotten the bobcat inside anyways. "It wouldn't have fit in my little cat carrier," she says.